If you’ve been injured due to electric shock, contact this Fort Lauderdale Electrocution Lawyer today. Electric shock is defined as electric current passing through the body. It can be caused when a person touches an electrically charged object. The consequences of electrocution/electric shock can be catastrophic. For one, electrocution/electric shock can cause severe burns to the body. Frequently, electrocution causes skin or clothes to ignite, and that can lead to severe burns. Additionally, electrocution/electric shock can cause neurological problems and vision problems as well. Contact Mr. Quackenbush if you’ve been hurt due to electric shock anyplace in Florida (including Palm Beach County, West Palm Beach, Miami-Dade County and Miami). This Fort Lauderdale Electrocution Lawyer can be reached at 954-448-7288. At no charge, he will discuss all aspects of your case with you. There are restrictions on who can be a beneficiary of the estate, so it is best to call Mr. Quackenbush to figure this out. If you’ve been injured by electrocution/electric shock, who the defendant in your case is will depend on where the electrocution/electric shock occurred. If it happened on the property of another person or entity, then your case will be against that person or entity. In that situation, your case will be referred to as one of premises liability. If you were electrocuted by a product (such as an electric tool), then you may have a products liability case against the manufacturer of the product. 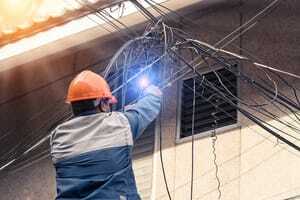 In a premises liability case, you will need to prove that the property owner either 1) knew of the dangerous condition (that caused the electrocution) or 2) should have known of it. You can prove that the property owner knew of the dangerous condition using testimony (e.g., somebody testifies/states that the property owner knew of the dangerous condition) or physical evidence (e.g., there’s a video of the property owner inspecting the dangerous condition before the incident, or there’s a document which shows that the property owner knew of it). On the other hand, you can prove that the property owner should have known of the dangerous condition by showing that the dangerous condition existed for a long enough time period that the property owner should have become aware of it. After all, if the dangerous condition existed for a long period of time, then you can easily make the argument that the property owner should have detected, and fixed, it. The statute of limitations for a premises liability case in the State of Florida is four-years. This means that, if you or a loved one is hurt due to electrocution/electric shock, you have four-years from the date of the incident to file a lawsuit. If you don’t do this within the four years, your case will be forever time-barred. One frequent type of electrocution case results when a victim is electrocuted after touching a “live” electrical wire. If FPL (Florida Power and Light) installed the live wire or failed to fix it and you were injured as a result, then you may have a case against Florida Power & Light. For example, you may have been hurt while working on a tree that was touching a live wire. Electric current can potentially reach and injure you that way. Many workers are electrocuted while on the job. This may be the result of the worker touching a high voltage line, touching power lines, underground or overhead wires, etc. If this occurs, then the worker must pursue a worker’s compensation case. This is because, in the State of Florida, as long as your employer carries workers compensation insurance for you, you cannot sue your own employer. The only exception to this would be if your employer was guilty of “gross negligence” or “willful and wanton” behavior. Gross negligence is negligence that is so reckless as to go beyond simple negligence. On the other hand, if you were injured on the job due to your employer’s simple negligence or if it was just a complete accident (i.e., nobody’s fault), then you will be stuck pursuing a worker’s compensation case for your medical bills and lost wages/time missed at work. However, you can still pursue a personal injury case if you’re able to find some other third party at-fault for the accident. For example, if some other outside company installed some wiring at your place of work and you were electrocuted as a result of that wiring, then you may be able to pursue a case against that outside company. After you’ve sustained injuries due to electrocution anywhere in Broward County (including Coconut Creek, Cooper City, Coral Springs, Dania Beach, Davie, Deerfield Beach, Hallandale Beach, Hollywood, Lauderdale-by-the-Sea, Lauderdale Lakes, Lauderhill, Lighthouse Point, Margate, Miramar, North Lauderdale, Oakland Park, Parkland, Pembroke Pines, Plantation, Pompano Beach, Southwest Ranches, Sunrise, Tamarac, West Park, Weston and Wilton Manors), contact Mr. Quackenbush at 954-448-7288 to talk about your case for free.